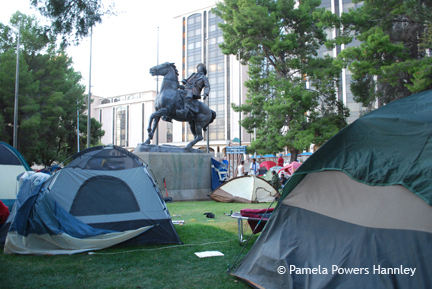 Occupy Tucson tents in Veinte de Agosoto Park. I think there is some naivete here about the Safe Park encampment, which is not quite so simple as Blogforarizona seems to suggest. As a Tucson resident and participant in the 2011 Occupy Tucson, I have reservations about the Safe Park Initiative and the Occupy Public Land (OPL) group that is behind the initiative. So, the two OPL organizers are supposed to receive a total of $500,000 for themselves — far more than the city’s homeless population that the organizers claim to represent. The Tucson homeless need better and more disinterested leadership than they are getting here.